"All My Preconceived Notions Went Away"
The photo shows a girl with long, curly hair and big expressive eyes. Her name, we’re told, is Christa. And she is an inmate at a maximum security prison in Tennessee. What led her there was an unspeakably gruesome crime. She had lured a girl she suspected of sleeping with her boyfriend into an isolated area, stabbed her, bashed her head in with a rock, and pulled the skin off her skull. Christa was all of 18 years old then. A jury found her guilty of murder. She was sentenced to die by electric chair. It’s not an easy thing to do, looking at the photo. Those eyes, the girlish pose. Who would have thought? Hard to imagine what it must have been like taking the picture. 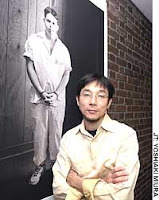 But that’s what Toshi Kazama has been doing for the past 15 years – meeting and photographing young death row inmates in the United States, and more recently, Taiwan. He’s in Singapore for the first time today to share with us his work and his philosophy. Toshi is a slight man with a gentle demeanor. Yet he speaks with conviction, humour and passion. The stories he tells are at once shocking and moving. Michael had been found guilty of savagely killing an elderly lady and a man in separate incidents. The police uncovered several sets of fingerprints at the two crime scenes but the boy was the only one who admitted to being present in both places. And so, he was arrested. No one else was charged for the murders. Michael has an IQ of 67. There are more pictures. Young people, some smiling, others scared and shy, a few serious and contemplative, staring at the camera, challenging our perceptions of what a death row inmate should look like. Some of the convicts had done no wrong and should not have been in jail at all. Others, like Christa, could not deny they had blood on their hands. Half, we’re told, are now dead. Toshi’s stand, no matter the crime, remains the same – taking anyone’s life, anyone’s at all, for whatever reason, is wrong. Killing, to him, is unconscionable. If ordinary citizens flinch at the thought of murder, why should they give the state the right to murder on their behalf? What makes Toshi’s message truly powerful is the fact that he himself is a survivor of a violent crime. Eight years ago, while picking his daughter up from elementary school in New York, he was attacked by unknown assailants, beaten and left for dead. Doctors thought he would not survive and told his wife and three children to say their last goodbyes. But Toshi pulled through and despite predictions that he would have to spend the rest of his life in a wheelchair, he managed to walk again. He continues to suffer though. Damage to his brain has robbed him off his sense of balance and left him deaf in one ear. Toshi, the victim, does not want vengeance or believe that capital punishment acts as an effective deterrent against violent crime. To him , finding out what causes a person to commit an offense is far more important – something, he says, communities that are overly reliant on harsh laws tend to overlook. Some of Toshi’s most haunting images feature no human beings at all – an electric chair in Alabama nicknamed “Yellow Mama”, a table where last meals are served and eaten, a room covered in black sand in Taiwan where prisoners are shot, a chamber where lethal injections are administered. He pauses at one photo and points to a black square in the background. It’s a one-way mirror where victims’ families can look out, undetected, at supporters of a condemned prisoner as they witness his execution. Perhaps the person who designed the space thought that seeing the supporters’ grief would help bring about a sense of closure for these families. The gesture is at once thoughtful and frightening. Read more about Toshi’s talk here.